Let’s face it we all have good and bad hair days. The bad, we hope just aren’t for the more important times in our lives. I am told by the way (by many) that I should be thankful that I have thick hair (supposedly someday I won’t be the little old lady with the bald spot, because of this). But I can face it that my hair definitely can be less then manageable at times. I am seriously thankful that in almost 90 degree humid temperatures that I could have my hair swept up for my wedding day, but still I can’t do this for every night out or party I attend. 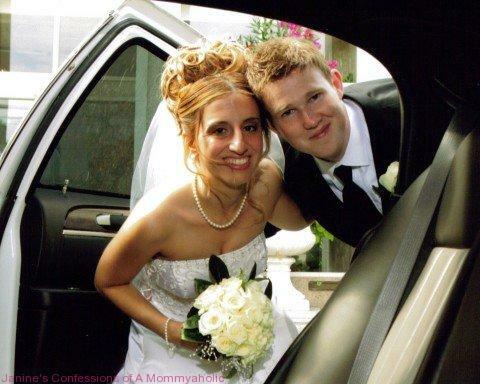 Let’s face it, this was my wedding! The perfect day and the perfect hair! So for most parties and such that I attend, I usually am on the lookout for new and different ways to style my hair, but also to keep my long thick hair manageable, too. Most recently, we had a family wedding to attend and as luck would have it, I was contacted days before by by Summer Rej of Dauphines of New York, to try her timeless headbands, which were inspired by glamorous style icons who exude a sense of personal style inspirational to others yet are able to remain effortless and carefree in their styles. 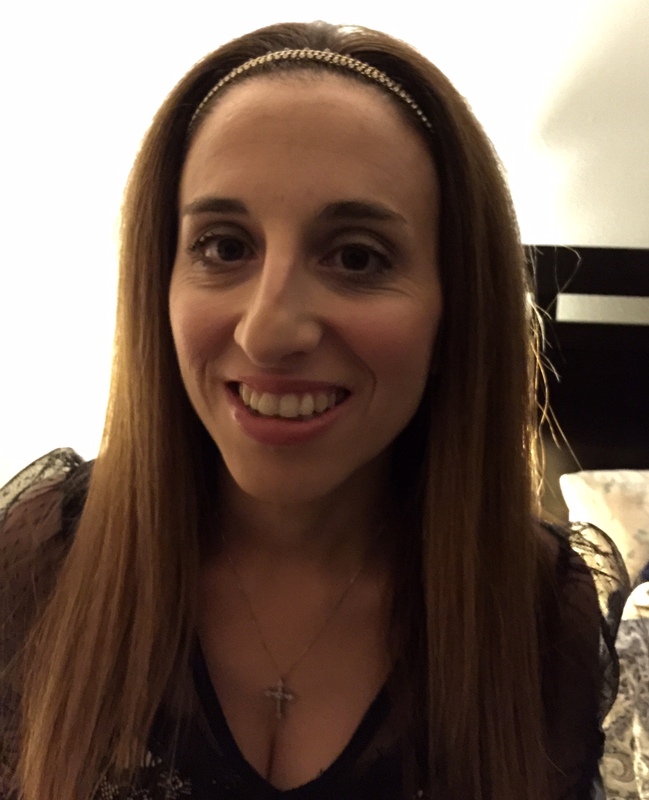 Quite simply, this is an accessory that combines fashion and function (two things I am totally a fan of by the way) – So it is a fun and yet an effective styling tool (By the way, I was in seventh heaven getting to review this beautifully designed headband and wear to a wedding, too). Hear it is…All Time Favorite Labradorite!! ALL TIME FAVORITE, LABRADORITE, which features three strands – a single strand of semiprecious gemstones (in Labradorite) on gold plated wire, a single strand of clear crystals, and an antique tone weightless metal link chain. Gold tone base and coordinating gold engraved findings. 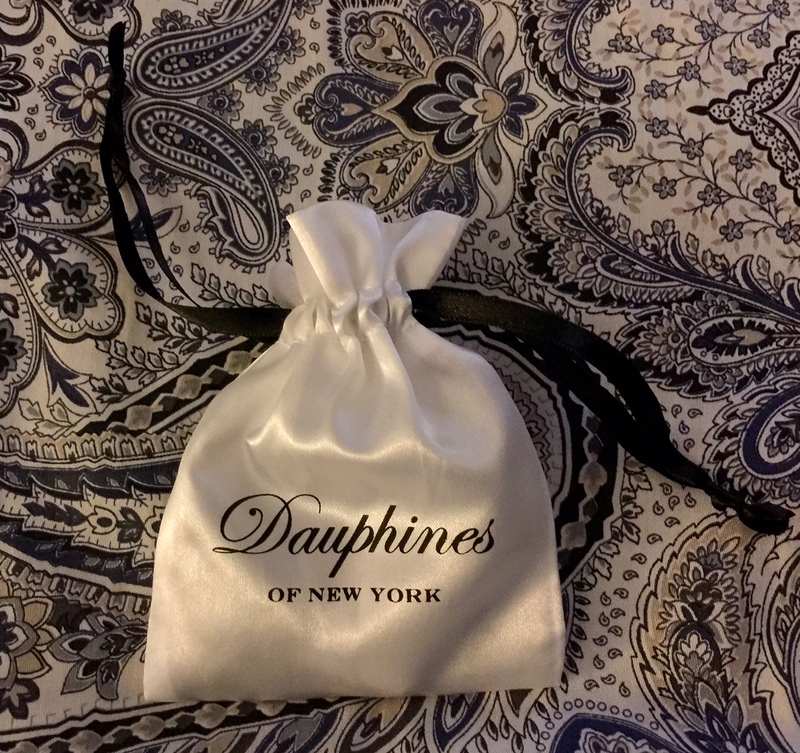 Loving my @DauphinesofNY #headbands #beauty #fashion #hair Get yours now…Find out how!! 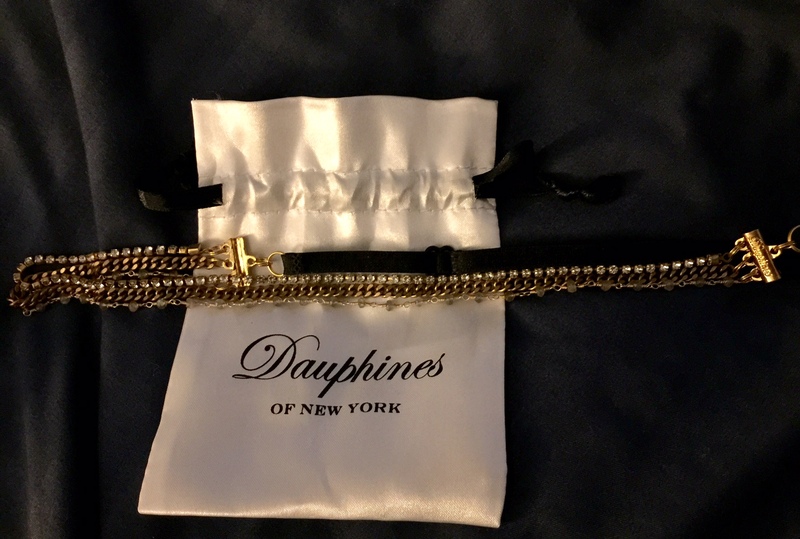 What Is Special About Dauphines of New York Headbands? Features their signature adjustable elastic band. 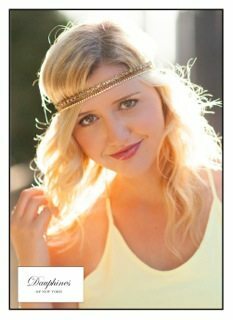 This band provides tailored comfort of fit, while also allowing the headband to be worn multiple ways; thereby, creating multiple or various hairstyles and hair looks. Will never slip out of place since the adjustable band provides individual sizing. You can wear your new headband for hours on end, without feeling anything in your hair. Create the illusion of an intricate hairstyle, with instructions provided via our quick and easy styling guide, included with your new accessory. Packaged in a keepsake box, including an instruction card demonstrating easy to model hair looks. May be worn by anyone as the colors and materials will beautifully compliment many hair tones. Ornate and appropriate to cap a black tie ensemble, while also remaining casual enough to be worn with everyday attire. May even be worn as necklaces. True jewelry for the hair – a keepsake for years to follow. How Can Dauphines of New York Headbands Be Worn? Place your headband gently atop the crown of your hair. We suggest starting 1” from the natural hairline. Adjust the elastic band at back so headband feels secure. Take a 1” portion of hair at left or right. Separate this 1” portion and twist. Then, take this twisted 1” piece of hair and tuck into the elastic band. Repeat at the other side of hair. This will leave hair tucked in at both left and right side, creating an elegant look. You may choose to leave the loose hair down, for a half up/half down effect. Or, you may choose to follow the next step to create a quick up-do. Take all loose hair, grip the hair tightly, and then twist. Once hair is held in a twist, tuck the hair up into the elastic band. Continue to roll the hair into the band. Roll tightly for a pristine and polished look, or loosely tuck the hair into the band for a laid-back effect. Create a clean and crisp look, while keeping hair polished and in place, out of the way of the face. Drop your new headband over your head, and then pull down towards the neck. Pull your headband up. As you pull the headband up, you will simultaneously pull your hair out of your face. A great way to wear your new headband is “hippie” style – worn horizontally and straight across the forehead. Layer over your hair and allow hair to flow naturally. Drape headband over head and place horizontally across the forehead. Tighten the elastic band at back. Straighten three chains so they are aligned, or select to twist the multiple chains for an edgy look. Elongate the elastic band, drape over neck, Finally, shorten elastic band at back. Where Can You Find Dauphines of New York Headbands? 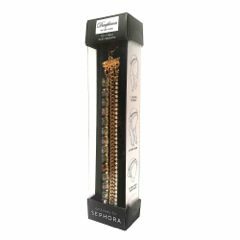 Dauphines of New York had eight brand new styles designed EXCLUSIVELY FOR SEPHORA, which are currently available for sale online to ship locally and internationally, too. By the way, three of these eight styles (Front Row Darling, Screen Siren, and Free Spirit) are also currently available for sale at stores nationwide throughout the US and Canada. Each style is priced at $24 -$40 and may be found in Sephora’s “Beauty on the Fly” section. 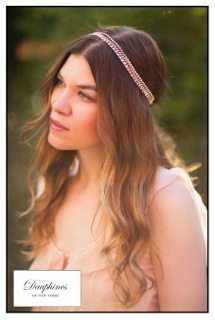 With Christmas and New Year’s Eve right around the corner, Dauphine’s of New York headband is seriously the perfect hair jewelry for the hair for these types of celebrations, as well as gifts even for every day use, too. And a side note, we have a Sweet Sixteen masquerade ball to go to later this week and take two guesses as to which of my ‘favorite’ hair accessories I will be wearing to it now?! My hair is naturally curly and I pay a small fortune to straighten it with keratin. I hate my curls. I recently cut my hair so my hair is extremely short now which is the way I like it. No fuss. I love the looks of these headbands. They would not only make my boring look so much more sophisticated. I may check them out and maybe get one for my oldest. She’s totally into headbands. The headband looks so cute on you! So very elegant! This is super cute! I love how many different options for styling you can use this with. I think I have a teen who would really like this! That’s a great looking headband, and you look great in it too. As for your wedding day picture, I love that picture, and your updo was GORGEOUS! These look gorgeous! I can never find a good headband that I like! Thanks Janine! Ooooohhhh now this would make a fantastic stocking stuffer for my daughter. Brilliant. Thank you Janine! Oh gosh Janine- that is such a beautiful piece!!!! And it looks gorgeous on you!! I just love those… so beautiful AND functional! WIN-WIN! those are so pretty, but would get lost in my curls…I am growing them out, so they are even longer and curlier. Love that pic of you babe…smoking! I have definitely notice the trend for these headbands. My daughter’s friend wears one almost everyday. They are cute. You are styling in it. I am sure you were looking great for the wedding. Very pretty embellishments! Definitely glams up the everyday or even for a date night! I remember scrounging last minute for a headband because it was windy the day of my engagement shoot. It was actually pretty hard to find a pretty one at the time. Would have been nice to have this sparkly one :). These are so cute! My daughter would love the bling! Some of those styles might actually work with my hair. I prefer to have bangs and that makes headbands difficult. I never met a headband I didn’t like and I especially love ‘dressy’ headbands since I have such short hair! Sometimes a fancy headband is the only way for me to dress up my ‘do these days!! I’ll have to hop down to Spehora and get one. Thanks for the great review! What a great headband and a gorgeous picture of you modeling the one you wore out!!! I have not sported a headband since I moved. Of course, this one is much nicer than any that I’ve ever owned. Very cute! I have really thick hair too – humidity is brutal for me. Seriously, Monica from friends… that was me in Hawaii! I love your headband of choice and that you shared some fun ways to wear it. Gorgeous headband! It looks great on you! I’m like you – seriously thick hair. My stylist breaks a sweat from cutting and blow-drying my hair. I’m surprised at how many people use a little help with their hair, but I totally get it. It’s brilliant. That is beautiful! and you are absolutely radiant Janine! So, like the utter moron that I am, overdue for a haircut, I cut my own bangs a couple of nights ago. To say I need some new accessories is an understatement. I’m going to check this one out right now – I like the idea that it doesn’t slip around! I am all about my hair, just like Lady Gaga said. I am terrible at styling it though! I have a lot of it and frequently break down to have someone else blow dry it because I can never make it look as good as I want it to. These headbands are so pretty! I am terrible at accessorizing, but this looks easy!! I actually love wearing head bands. There are some that cause headache though so I’m particularly careful in choosing. That headband is a nice choice! Love it!! I only wear headbands at the gym, but it may be fun to try one with a little dressier look. I will check them out, Janine – thanks! These are really cute. I love wearing headbands, but I have a hard time finding one that works because my head is so big! Maybe this would work? How cute are these? I can wear this! I have locs…not sure if you remember me sharing that I started my locs a few months back. Covering my hair actually helped them form a bit from what I’ve heard, but they are starting to look more and more like the way I want them and you can still see my curl. 🙂 But apart from head wraps, I love to wear head bands of all styles. This would be a nice way to switch it up! It’s cute on you! This is SO GORGEOUS! I am so loathe to try headbands, but I want this! So classy and elegant, Janine!